Star Trek: Deep Space Nine marks the edge of the frontier. In both a literal and metaphorical sense. In discussing Deep Space Nine, it is important to acknowledge the influence and success of Star Trek: The Next Generation. Nothing that Deep Space Nine accomplished would have been possible without the framework and support provided by The Next Generation. Indeed, while Star Trek: Voyager ran for seven years running off the same narrative template established by The Next Generation, it was Deep Space Nine that extrapolated from The Next Generation. In many ways, Deep Space Nine is a more faithful extension of The Next Generation than Voyager, in that is boldly pushing forward. Deep Space Nine built off the successful narrative experiments conducted by The Next Generation, using them as a springboard for newer and bolder storytelling. The Next Generation teased the idea of recurring alien guest stars like High Chancellor Gowron, Captain Kurn, Commander Tomalak, Commander Sela. Deep Space Nine built an ensemble out of alien characters like Dukat, Martok, Damar, Rom, Zek, Winn, Bareil, Garak, Shakaar and many more. The Next Generation teased serialisation with plots involving the Klingon and Romulan Empires, but Deep Space Nine embraced it wholeheartedly. Deep Space Nine was consciously experimental, perhaps reflecting its position as a “secondary” Star Trek series. In fact, Deep Space Nine remains the only Star Trek series to completely overlap with other Star Trek television series, give or take a few months between the end of The Next Generation and the start of Voyager. The Next Generation ran for five and a half seasons before Deep Space Nine started, while Voyager ran two years by itself after Deep Space Nine ended. In its final five years, this cast was one of three Star Trek ensembles working at the same time, as The Next Generation transitioned to film. As a result, Deep Space Nine never quite garnered the attention of the other Star Trek series while it was on the air. The Next Generation had revived the franchise and proved an innovator in terms of television syndication. Voyager had served as the launching pad for UPN, and would exist as the young network’s flagship. In contrast, Deep Space Nine was always there, just ticking along in the background while attention was focused on the franchise’s higher profile entries. This sense of disconnect from the larger Star Trek franchise was compounded by the fact that Deep Space Nine was the only Star Trek series not to be set on a starship. After all, the notion of exploring is part of the basic concept of Star Trek, baked right into the title. To casual observers, the existence of Deep Space Nine could seem counter-intuitive. “To boldly sit,” was a cliché dismissal of the series before Emissary was even broadcast. Indeed, certain sections of Star Trek fans still hold that against the series as a whole. To be fair, the series did very little to distinguish itself in its earlier episodes. Many episodes of the first season feel like cast-offs from The Next Generation, familiar concepts reheated with a new cast in a new location. Babel was the stock “crew experience crazy contagion” episode in the style of The Naked Time or The Naked Now, while The Passenger was a body hijacking in the style of Return to Tomorrow or Power Play. Recurring characters popped up frequently, like the Duras Sisters in Past Prologue, Q in Q-Less, Lwaxanna Troi in The Forsaken. Indeed, many of the hallmarks of the series would remain underdeveloped in these early seasons. Garak was introduced in Past Prologue, and disappeared for the rest of the season. Outside of a small appearance in Duet, Dukat was confined to serving as an antagonist in Emissary. Many of the recurring characters that would come to define the series in the years that were followed were largely absent, with characters like Bareil Antos and Winn Adami only introduced in the season finale In the Hands of the Prophets. The first season of Deep Space Nine did not distinguish itself. However, there was a sense that the series was consciously pushing itself. The show could often be seen toying with ideas that existed beyond the remit of The Next Generation; the station’s inhabitants’ fear of Odo in A Man Alone, Kira’s history as a terrorist in Past Prologue, the reinvention of the Ferengi that began with The Nagus. Even seemingly generic episodes like Babel could be rooted in the show’s status quo. The first season ended with a double-whammy of Duet and In the Hands of the Prophets, two big-ticket Star Trek stories about broad philosophical issues with a great deal of contemporary resonance. It is a truism that each of the Berman era Star Trek series took a lot of time to grow into themselves, only really fulfilling their potential in their third or fourth seasons. In some ways, this demonstrates the luxury of nineties television broadcasting, that these dysfunctional series would be allowed the time to develop and explore without fear of cancellation. There was time for the production team to experiment, to figure out what worked and what didn’t. Often, this involved radical retooling, as demonstrated by the behind the scenes turmoil on the early years of The Next Generation or Voyager. Deep Space Nine was different, in that its evolution always felt organic and confident. There was always a sense that the writing staff knew what they wanted to accomplish in terms of production, even if their storytelling was often improvised in the moment. Michael Piller and Rick Berman recruited Ira Steven Behr to work on Deep Space Nine with an understanding that their gaze would shift to Voyager towards the end of the second season. Behr was always intended as a steady hand to guide the ship, even if he would not begin to really assert control until around The Maquis, Part I and The Maquis, Part II. The early years of Deep Space Nine are turbulent, but not as turbulent as The Next Generation or Voyager. The show never quite judders or reverses course, even as its focus shifts over time. Into the second and third season, Deep Space Nine begins to turn its gaze away from Bajor and towards the Dominion, but the switch in not as jarring as the transition between the second and third seasons of The Next Generation or as Michael Piller’s strange creative odyssey on Voyager. The production team on Deep Space Nine never seem to panic about elements that are not working, instead focusing on what is working. The early seasons of Deep Space Nine have a strong focus on Bajor, particularly the planet’s religious politics. This story thread simmers through episodes like Battle Lines, In the Hands of the Prophets, The Homecoming, The Circle, The Siege and The Collaborator. In the third season, Deep Space Nine would begin shifting its focus away from Bajoran politics, instead using the planet as a background setting for personal stories like Shakaar or Crossfire or religious stories like Destiny or Accession. However, the production team continued to tell serialised long-formed stories with long-running threads. Indeed, the early seasons of Deep Space Nine could often stubbornly refuse to give up on elements that were not clicking. In the early seasons, Deep Space Nine had several “problem” characters, members of the core ensemble without a strong sense of identity who could not comfortably anchor an episode. Julian Bashir found himself at the centre of trite formulaic episodes like The Passenger or Melora or Distant Voices. Jadzia Dax spent more time as host to a macguffin than as a character in her own right in episodes like Dax or Invasive Procedures or Equilibrium. Most other television shows would just abandon these characters and allow their actors to wallow in obscurity filling out meeting room scenes or providing plot exposition. Voyager seemed to give up on about half of its primary cast by the end of the second season; Chakotay, Tuvok and Kim spent most of the run in the background or as characters at the heart of generic stories. In contrast, Deep Space Nine would spend time iterating over these character and elements, trying to find a way to make them work. As a result, the early seasons of Deep Space Nine often feel like rough sketches, iterations of an idea refined over three years. This is most obvious in the transition between the second and third seasons. The final third of the second season hones in on a lot of the ideas that would make Deep Space Nine soar in its final four years; Blood Oath is a fantastic Dax-centric story, The Wire hones in on Bashir as an effective foil to the series’ cynicism, Tribunal properly weaponises the “O’Brien must suffer” template established by The Storyteller or Armageddon Game. However, after building to the reveal of the Dominion in The Jem’Hadar after seeding them in stories like Rules of Acquisition and Shadowplay, the third season pushes the series even further out of its comfort zone. The Search, Part I and The Search, Part II are effectively an awkward second pilot for the series, properly introducing a new series-defining threat in the Dominion while also establishing the Defiant and a whole host of elements used to varying degrees of success over the following year; Michael Eddington, Subcommander T’Rul. The third season struggles with serialised storytelling on a very basic level, trying to find a way to keep the audience engaged with threat posed by Dominion in episodes like The Abandoned. 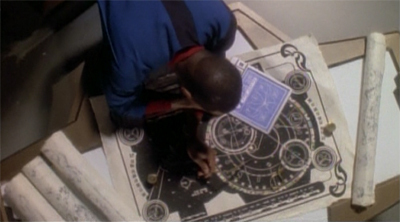 The series makes any number of mistakes along the way, from generic carefree missions to the Gamma Quadrant in episodes like Meridian and Destiny through to the awkward decision to push its biggest Dominion-centric episodes like Improbable Cause, The Die is Cast and The Adversary into the final stretch of the year. There is a roughness to the storytelling that is distracting. At the same time, all of this rehearsal and practice pays off during the fourth year, when all of these rehearsed elements click into place. The Way of the Warrior is effectively the show’s third pilot, and it flows beautifully. It serves as the perfect jumping-on point, a confident reinvention for Deep Space Nine. It feels like Deep Space Nine spent three years revising and improving on itself, so that its fourth season could flow effortlessly. Any season of twenty-six episodes will have duds, and the fourth season has Rules of Engagement, The Muse and Shattered Mirror, but the rest of the season hums. The rejuvenating success of the third season of The Next Generation had largely been down to a rejection of a lot of the problems with the first and second seasons, with incoming producer Michael Piller focusing on character dynamics and relationships rather than broad science-fiction concepts. However, the the fourth season of Deep Space worked in large part because it built upon past innovations and successes. The Visitor was a powerful and emotive piece of storytelling, but one that owed its existence to Explorers. Homefront and Paradise Lost owed a lot to Improbable Cause and The Die is Cast. Indeed, the fourth season is notable for the fact that even its episodes focusing on notorious “problem” characters work almost perfectly. The writers finally figured out how to write for Julian Bashir, and the character anchored three of the season’s standout episodes; Hippocratic Oath, Our Man Bashir and The Quickening. Similarly, Dax got a compelling character-driven episode in Rejoined. Even Quark was the focus of three very different and very engaging stories; Little Green Men, Bar Association and Body Parts. The fourth season is a great example of a show firing on all cylinders. Along the way, Deep Space Nine moved closer and closer to a model of serialised storytelling. The fourth season focused on the disintegration of the alliance between the Federation and the Klingons, a thread that simmered across the season through episodes like The Sword of Kahless, Return to Grace, Rules of Engagement and Broken Link. However, Deep Space Nine was a series very much invested in long-term consequences. Its plotting was often built around the idea that events and actions had ripple effects, creating an unpredictable chain of causation that could lead to the most unlikely of outcomes. The Next Generation had established the geopolitical framework of the twenty-fourth century, exploring the politics of the Romulan Star Empire, the Cardassian Union, and the Klingon Empire. However, the interactions between these elements were largely fleeting, such as the Romulan manipulation of the House of Duras during the Klingon Civil War in Redemption, Part I and Redemption, Part II. As with a lot of what made Deep Space Nine so compelling, the younger spin-off took this basic concept and ran with it. Deep Space Nine afforded a great deal of agency to the world around the Federation. Although The Next Generation acknowledged the internal politics of other powers, it did so through the lens of its Starfleet characters. Deep Space Nine was the first Star Trek show to imagine life outside the framework of Starfleet. Indeed, almost half the cast existed outside the organisation. Quark was a Ferengi who had worked on the station under the Cardassians. Kira was a member of the Bajoran militia and a former terrorist. Odo had worked with the Cardassians. Perhaps most compellingly, Jake Sisko decided not to join Starfleet in Shadowplay. This was a bold decision, one that clearly came as a surprise to his father. Over the next few years, in episodes like Explorers, The Visitor and The Muse, Jake forged his own identity as a writer outside the framework of Starfleet Command, the franchise’s first human regular character not to be a member of Starfleet. In fact, Jake even remained behind after the Federation withdrew from Deep Space Nine in Call to Arms, in order to cover an enemy occupation of the station. Across the length and breadth of Deep Space Nine, the series repeatedly stressed that Starfleet and the Federation were just one perspective in a diverse and chaotic universe. Over the course of Deep Space Nine, the production team would repeatedly construct stories with their own diverse ensembles, often without a Federation or Starfleet viewpoint character: the Klingon stories in Soldiers of the Empire, Sons and Daughters, Once More Unto the Breach; the Ferengi stories in House of Quark, Family Business, Ferengi Love Songs. Deep Space Nine imagined a truly diverse and multipolar universe. Indeed, Starfleet often felt like just one of several major powers in a complicated geopolitical climate. In the middle seasons, Starfleet would frequently find itself standing on the sidelines as major events unfolded around them. The Romulans and the Cardassians staged a preemptive strike on the Dominion in Improbable Cause and The Die is Cast, while the Klingons mounted an invasion of Cardassian territory in The Way of the Warrior. There was a sense that these entities not only had their unique perspectives, but also their own agency. Tellingly, Deep Space Nine repeatedly suggested that social change within these great powers could not be imposed from outside. Star Trek and The Next Generation seemed to suggest that the Federation could improve its neighbours and allies, as reflected by Kirk’s adventures in episodes like Return of the Archons, The Apple or For the World is Hollow and I Have Touched the Sky and the superiority of the Starfleet crew in episodes like Lonely Among Us or The Last Outpost. Deep Space Nine rejected these ideas, from the outset. When Bashir cites the Prime Directive in Battle Lines, Sisko forcefully refuses to use that regulation as justification for prolonging the suffering of others. Crossover represents a very direct response to Kirk’s revolutionary tendencies, revealing that his unilateral once-off intervention in Mirror, Mirror had dire long-term consequences for a world with which Kirk only interacted fleetingly. Deep Space Nine firmly rejected this idea, even through small touches like the “root beer” monologue in The Way of the Warrior. In the world of Deep Space Nine, cultures evolve through internal forces. Those internal forces are shaped and influenced by outside actors, but Deep Space Nine earnestly believes that societies can only be changed through a genuine desire that stems from their own citizens. The Ferengi Alliance gradually liberalises over the course of Deep Space Nine, particularly in episodes like Ferengi Love Songs and Profit and Lace. However, these changes are not the result of outside meddling. Instead, this desire to rework Ferengi society originates with Ishka and Zek, and will be continued through Rom. Of course, some of these changes are assisted by the Federation and Starfleet. The Klingon Empire is redeemed through the ascension of Martok in Tacking Into the Wind, but that is only made possible through Worf’s intervention. Damar decides to actively rebel against Dominion rule in The Changing Face of Evil, but depends upon tactical advice from Kira and the Federation. However, these characters are presented as supporters and enablers, but they do not intervene as casually or unilaterally as Kirk or Picard. The Klingon Empire, the Cardassian Union and the Ferengi Alliance are allowed to change on their own terms. Deep Space Nine embraces the utopian ideals of Star Trek within the context of a multicultural world. There is no doubt that characters like Worf, Garak and Quark are changed by their experiences interacting with the Federation. Garak finds himself unable to stomach the torture of Odo in The Die is Cast. Quark decides to break a contract in order to preserve his own life in Body Parts. These are characters who venerate their cultural traditions and their heritage, but who find themselves affected by the liberal utopianism of the characters around them. In the world of Deep Space Nine, actions had consequences. Reactions rippled across the cosmos. The writers of Deep Space Nine have acknowledged that they plotted a lot of the show on the fly, even if they did have some sense of the direction in which they were heading. However, a lot of the major plot twists feel logical and organic, extrapolated from earlier events. The disastrous military failure in Improbable Cause and The Die is Cast destabilises the Cardassian Union, which makes them easy prey for the Klingons in The Way of the Warrior, which leads them to forge an alliance with the Dominion in In Purgatory’s Shadow and By Inferno’s Light. This plotting holds together very well across the length and breadth of the series. Characters feel like they have organic arcs. Sisko starts as a burnt out Starfleet officer indifferent about his assignment in Emissary. As the show goes on, he becomes increasingly cynical about Starfleet while coming to embrace the makeshift family that he has found on Deep Space Nine. When he announces his plans to retire on Bajor in Favour the Bold, and begins to follow through on them in Penumbra, it feels like organic character development. In fact, even minor characters were allowed major arcs. Michael Eddington was introduced in The Search, Part I and The Search, Part II as a potential substitute for Miles O’Brien, but he gradually grew and developed into a multifaceted character; he confessed his ambitions in The Adversary, became a rebel freedom fighter in For the Cause and For the Uniform, and even earned Sisko’s respect in Blaze of Glory. This was a character who arguably received more development than most of the primary cast on Voyager. This was in many ways a result of Deep Space Nine‘s experiments with serialisation, which applied as readily to interpersonal relationships as to galactic politics. Significant portions of the cast ended up involved in romantic relationships over the course of the series; Jadzia Dax and Worf got together in Looking for Par’Mach in All the Wrong Places, Rom and Leeta hooked up in Doctor Bashir, I Presume, Odo and Kira started dating in His Way, Ezri Dax and Julian Bashir made out in The Dogs of War. There was a sense that characters were allowed to develop and to grow over the course of the series, even together. To be fair, this was rather controversial among certain types of Star Trek fans, who liked the more sterile interpersonal relationships of The Next Generation and Voyager. On The Next Generation, the relationship between Riker and Troi remained ambiguous for seven seasons while Picard and Crusher kept their distance from one another. On Voyager, Paris and Torres did eventually get together and start a family, but they were the exception; Janeway and Chakotay left any feeling unspoken outside of riddles in Resolutions, while Neelix and Kes broke up their relationship when Kes’ body was hijacked in Warlord. To these fans, Deep Space Nine was likened to a “soap opera”, perhaps reflecting the gendered assumptions of nineties science fiction. This reflects one of the more subtle ways in which Deep Space Nine challenged the preconceived notions about what a Star Trek series could be. With Deep Space Nine, Star Trek could be a story about people and their interpersonal relationships, about the dynamics and bonds that form between individuals who work together for extended periods. Many of the relationships between characters developed slowly and over time. Bashir and O’Brien developed from awkward colleagues in The Storyteller to best friends in Extreme Measures, often through small exchanges and asides. Characters on Deep Space Nine tended to develop through subplots and beats in the background of other episodes; Sisko began dating Yates in Family Business, while she talked about moving to the station in Indiscretion, betrayed his trust in For the Cause, and returned to his life in Rapture. Characters seemed to genuinely grow over time, life captured in small moments. Indeed, this became something of a central thesis on Deep Space Nine. The show was often wary of large-scale institutions, including Starfleet and the Federation. The series suggested that Starfleet and the Federation were at best indifferent to the plight of real people in The Maquis, Part I and The Maquis, Part II, and expressed wariness about Starfleet as a military institution in Homefront and Paradise Lost. Indeed, Inquisition suggested similar concerns, although the decision to place Section 31 explicitly outside the Federation’s remit undercut it somewhat; Inter Arma Enim Silent Leges did a better job. Instead, Deep Space Nine always retained its faith in people. Individuals seemed to be the key building a better universe. At the end of Deep Space Nine, it seems like most of the major powers are governed by outsiders and exiles. Martok becomes High Chancellor in Tacking Into the Wind, despite his low-born status. Rom becomes Grand Nagus in The Dogs of War, despite never having a head for business. By the end of What You Leave Behind, even the exiled Garak seems to have assumed a prominent position in the new Cardassian government. A lot of this was heavily improvised by the writing staff. To be fair, this approach to storytelling was something of a mixed bag. While it worked wonders for stories like the tragedy of Cardassia and for the arcs of most of the main characters, the results could occasionally be disjointed. On a larger scale, the narrative arc focusing on Bajor degenerated from ambitious ambiguity in Emissary into stock science-fiction mystical nonsense in episodes like The Assignment and The Reckoning, building to a point where it turned out that Sisko’s entire seven-year character arc was building to a point where he pushed Dukat off a cliff into some fire. Even in terms of character arcs, certain decisions seem like weird disjointed cul-da-sacs in terms of the over-arching plot. Dukat a significant stretch of the fourth and fifth seasons of Deep Space Nine as a space pirate in episodes like Return to Grace and Apocalypse Rising, before ascending to the head of the Cardassian Union. Such a development seems strange. Similarly, Dukat’s conversion to a devotee of the Pah-Wraiths between Tears of the Prophets and Covenant, coupled with a desire to strip the character of any moral nuance, also radically undercuts his appeal. However, these poor storytelling choices are the exception rather than the rule. Even allowing for some of the strange choices made with Gul Skrain Dukat, the character remains one of (if not) the best antagonists in the history of the franchise. Deep Space Nine takes the time to flesh out Dukat in stories like The Maquis, Part I, The Maquis, Part II, Civil Defense, Defiant and Indiscretion. The result is a character who is compelling and engaging, but one with his own defined perspective and beliefs. This is an example of the power of long-form storytelling on Deep Space Nine. Of course, the most powerful example of long-form storytelling on Deep Space Nine is the Dominion War. Beautifully seeding through the second half of the fifth season, with groundwork laid in episodes like Ties of Blood and Water or In the Cards, the Federation finally declares war on the Dominion in Call to Arms. This leads to the unprecedented plot development of the Federation being forced to retreat from Deep Space Nine and cede the station to the Dominion. Sisko and most of the Starfleet crew would spend the first six episodes of the sixth season trying to get back to the station. Star Trek had never told a story like this before, with the possible exception of the loose trilogy formed between Star Trek II: The Wrath of Khan, Star Trek III: The Search for Spock, and Star Trek IV: The Voyage Home. It was bold and ambitious storytelling. Even allowing for the misfire of Sons and Daughters, these episodes construct a truly epic narrative about the powerful tide of galactic affairs and the lives caught in the crossfire. They remain a franchise highlight, even twenty years after the fact. Of course, it should be noted that Deep Space Nine embrace innovation in other ways. Although it is tempting to focus on the narrative innovations employed by the series, Deep Space Nine also benefited from technical advances in terms of science-fiction storytelling on television. Episodes like The Die is Cast, The Way of the Warrior and Shattered Mirror demonstrated that Star Trek could feasibly depict epic space battles. Although less important narratively than innovations in terms of serialisation, this made episodes like Sacrifice of Angels, Tears of the Prophets and What You Leave Behind possible. The Dominion War was a story utterly unlike any which Star Trek had explored before. The franchise had told stories about the threat of war, as in Errand of Mercy. The franchise had told stories about the aftermath of war, as in The Wounded. The franchise had even told stories from the sidelines of war, as in Redemption, Part I and Redemption, Part II. However, Deep Space Nine represented the first opportunity to tell a story about an ongoing war involving the main characters within the framework of the Star Trek universe. This was controversial. Indeed, it remains controversial, with many critics arguing that it represents a betrayal of the utopian principles of Star Trek. However, the production team imagined the Dominion War as a crucible in which those values might be interrogated and tested. The Dominion War faced characters with impossible choices and horrific situations. This applied in both the abstract (Statistical Probabilities) and in reality (The Siege of AR-558). More to the point, the use of serialisation allowed the series to deal with the consequences of war, as in It’s Only a Paper Moon. As much as the Dominion War demonstrated the potential of serialised long-form stories within the framework of the Star Trek franchise, it also demonstrated some of the limitations imposed upon Deep Space Nine. The sixth season struggles slightly from a lack of direction following the battle to reclaim Deep Space Nine in Sacrifice of Angels, and there is a sense that the production team are pushing past the restrictions upon what was possible for a Star Trek television series in late nineties. Despite phenomenal episodes like Far Beyond the Stars, In the Pale Moonlight and Valiant, there is a sense that the Dominion War exposed some of the narrative constraints holding back Deep Space Nine. It would make more sense for Jadzia Dax to die in Change of Heart, as compared to Tear of the Prophets, but Star Trek was not about to kill off a regular mid-season. It would make more sense for most of the cast not to appear in Honour Among Thieves, but the episode still provides an awkward introductory scene using the ensemble. Still, the Dominion War brought out some of the best in Deep Space Nine and the larger Star Trek franchise. Most notably, the seventh season of Deep Space Nine is very clearly structured to build towards the finale. This is most obvious in the sprawling ten-episode conclusion to the series, but it also reflected in the plot and thematic points of stories like Treachery, Faith and the Great River or Chimera, and even in the casual “one last hurrah!” pleasure of nonsense episodes like Take Me Out to the Holosuite or Badda-Bing, Badda-Bang. However, the Dominion War ultimately served as a validation of (rather than an attack upon) the humanist ideals of the larger Star Trek franchise. The war was horrific and brutal, as war is and should be portrayed. However, the war ended in gestures of compassion and decency. As the Dominion attempted genocide against the Cardassians, the day was won with compassion and empathy; the Cardassians changed sides to fight against their oppressors, while Odo secured a cease fire by generously offering the Female Changeling a cure to the biological weapon that was killing the Founders. Deep Space Nine remained true to the ideals of Star Trek, even as it dared to examine them through a fresh lens. Deep Space Nine boldly pushed the franchise forward, into the twenty-first century, building upon the successes of the original Star Trek and The Next Generation. It expanded the frontier, questioning many of the underlying assumptions of Star Trek, while remaining true to its fundamental principles. Deep Space Nine was something new and interesting, while still being Star Trek. In that way, it was like The Next Generation. It could reasonably be argued that Deep Space Nine marked the last point at which the Berman-era franchise actually pushed outwards, and that the final seasons of Star Trek: Enterprise only catching up to what Deep Space Nine had been doing years earlier. Voyager was a show that looked backwards in more ways than one, while the first two seasons of Enterprise were even more regressive. Deep Space Nine represented something challenging and exciting, but it also marked a boundary that would remain uncrossed for another two decades. In more ways, Deep Space Nine marks the edge of the final frontier. Are there going to be any more DS9 reviews? These were really great! Kicking off Season Four of DS9 and Season Two of Voyager in September and October! That’s awesome! You do a really good job, I have enjoyed reading your reviews a lot. I can’t wait for fall to read the rest of DS9. Any idea of a timeframe on when you will be finished the entire series? Provisionally mid-2016. I have a crazy ambitious plan to do most of Star Trek by the fiftieth anniversary. I am two-thirds of the way through TOS, a little under half through TNG, a little under half through DS9 and about one-seventh through VOY. Planning to do all four seasons of ENT this year, another DS9 and VOY, and then plow into the rest of the Star Treks starting in January. But that is a crazy ambitious plan, so don’t hold me to it. Still my all-time favorite TV series! Less said about Voyager the better, huh? Ah, Voyager gets a tough time of it. I think it’s highlights stand with the best of the franchise, but they arrive too infrequently to count it as a brilliant (or even great) piece of television. I like it a lot more in hindsight than I did at the time; somehow knowing it’s never going to actually tell the story of a crew struggling to get home makes it easier to enjoy the episodic adventures. That said, I think that Enterprise is somewhat underrated as Star Trek goes. I think the first season is half-way between a Voyager retread and something much more interesting, even if it lacks the courage to break away from traditional Star Trek formula. The second season might be my least favourite season of Star Trek ever; it is the season where every criticism of Enterprise is valid and fair. But I think the third and fourth seasons – though messy – deserve serious reappraisal. Enterprise seriously lacked engaging characters. But it had far better storytelling than Voyager did. Voyager had some fairly decent characters, but dire storytelling; and as you said, was in love with that reset button formula. For a series that had a half Maquis crew, DS9 and TNG still did the only great Maquis stories. I quite liked Worst Case Scenario, but yes. Squaring the Maquis/Starfleet thing away in the second episode was not the best approach to storytelling. Enterprise really lacked diversity in character. Not just in the aliens/humans mix, but also in “mostly white and male” (only two women, and two minorities, in the cast). Counterpoint is Kate Mulgrew’s favourite Voyager episode too Darren. In fact, when she first read the script, she loved it so much she actually kissed it. And Burning Blogger of Bedlam, to my knowledge, TNG only did one Maquis episode, and that was the penultimate S7 episode Preemptive Strike. Although Journey’s End did lay much of the seeds for what became the Maquis. Anymore DS9 reviews in the future? I’ve been waiting for a long time, I really enjoy your reviews. Sorry, John. They were scheduled for September, but they got pushed back at the last minute because some stuff came up. They’ve been rescheduled for February, through, if that helps? They’re mostly written, just a few left. Thanks for the response Darren! I am really looking forward to reading them. What about TNG what’s the time frame? You’re reviews are my favorite on the net. You do a fantastic job, keep up the great work! No worries. Apologies about the delay in replying! The original plan, which is a bit shot now by factors outside my control, was to do DS9 S4/VOY S2 in September/October, and to do ENT S4 in December. That would then give me the freedom to spend 2016 (50th anniversary!) completing the full set of Star Trek reviews. TOS S3, TNG S4/S5/S6/S7, DS9 S5/S6/S7, VOY S3/S4/S5/S6/S7. Unfortunately that’s pushed back. I would expect DS9/VOY to run in February/March and TOS in May. I have to decide if April is to be TNG S4 or ENT S4. I would expect some TNG by the end of next year, with an eye to completing the franchise by around mid-to-late 2017. All going to plan. Long time reader of your exceptional reviews. Just wanted to know when the rest of the next generation and DS9 reviews will be posted? They are really good, the best reviews on the Web. Sorry didn’t read your reply above. Looks like I’ll have to wait till mid 2017. I’m looking forward to them. Well, we’re ahead of schedule on the DS9 front. The fifth season is underway. I’m doing the rest of my DS9 reviews at the moment. I’m interspacing them with Voyager, which should bring me up to the launch of Discovery. TNG will probably be after that. Darren, I know it’s a lot of work. But thanks for putting these up. I fell out of DS9 in the early Nineties and am binging on Netflix. I always make sure to get your take on each one just as I finish. One thing I’ve noticed for me – and you bring it up in the reviews as well – is a lot of similarity between DS9 and Battlestar: Galactica. The common denominator there is Ronald D. Moore, of course. But you can really see him trying things on the fourth season of DS9 that he later did again in BS:G.
I hope I can live up to that. The BSG parallels become more and more pronounced as the show goes on, particularly in the sixth and seventh seasons, that occasionally feel like rough drafts of what Moore wants to do with BSG. Hi Darren, I just finished reading your DS9 season 5 reviews. Very well done, thank you for putting so much time and effort into creating such an insightful look at one of my favorite shows of all time. Will you be able to finish and post season 6 and 7 in 2017? I would hope so, but can’t promise. I’m about half-way through S6 at the moment, but may take a breather between seasons. I’m taking a minor breather from Friday to review Iron Fist. Hi Darren, great work on DS9 season 6! I really enjoyed reading your reviews. You have so much insight, I’m planning on watching the whole series again just to see all the aspects I’ve missed. When will you have season 7 up? I’m looking forward to it. Hi John. The seven season reviews are going up as we speak. Voyager Season Five and DS9 Season 7 are going up Monday/Wednesday/Friday. I, too, am looking forward to the Season 7 reviews. I’ve been watching each episode and then reading the review, right through from the first season, and I have to say your reviews have given me some real insight into the show — and into why I always felt it was the best Star Trek of them all. What surprises me is how much I like the show now, perhaps even more than I did the first time through. Thanks Laura. Those seventh season reviews are being published at the moment, in tandem with Voyager. A stunningly well written overview of Deep Space 9. Well Done. But it would have great to see how the Cardassians dealt with losing 800 million of their own people (essentially their Holocaust), or even how the balance of power would have shifted in the Alpha Quadrant with 2 of the big powers brought to their knees. Ah well, I can always dream! Thanks Vijay! Glad you enjoyed! Yes, it would have been nice for them to cut some of the fluff from Seasons 6 and 7, and spend some of Season 7 exploring the aftermath. There was plenty of material to be mined there. Yep. It’s a shame. I am very curious about the hypothetical season eight on the upcoming blu ray.